پایا, حمید, تقی زاده, اکبر. (1397). تأثیر لازالوسید بر اکوسیستم و پارامترهای شکمبه ای گوسفند قزل. فصلنامه محیط زیست جانوری, 10(3), 53-58. حمید پایا; اکبر تقی زاده. "تأثیر لازالوسید بر اکوسیستم و پارامترهای شکمبه ای گوسفند قزل". 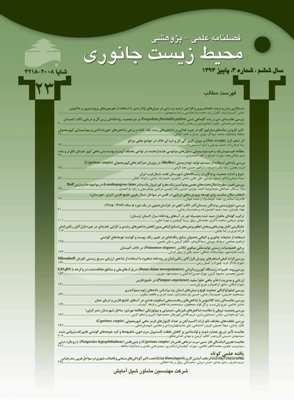 فصلنامه محیط زیست جانوری, 10, 3, 1397, 53-58. پایا, حمید, تقی زاده, اکبر. (1397). 'تأثیر لازالوسید بر اکوسیستم و پارامترهای شکمبه ای گوسفند قزل', فصلنامه محیط زیست جانوری, 10(3), pp. 53-58. پایا, حمید, تقی زاده, اکبر. تأثیر لازالوسید بر اکوسیستم و پارامترهای شکمبه ای گوسفند قزل. فصلنامه محیط زیست جانوری, 1397; 10(3): 53-58. تحقیق حاضر جهت بررسی تأثیر یونوفر لازالوسید بر پارامترهای شکمبه ­ایگوسفند قزل انجام شد. بدین منظور از 16 رأس گوسفند نر قزل در قالب طرح کاملاً تصادفی استفاده شد. جیره­ های غذایی براساس جداول احتیاجات غذایی بین المللی گوسفندان (1985) تهیه شد به ­گونه ­ای که حاوی 2/9 مگاکالری در کیلوگرم ماده خشک انرژی قابل متابولیسم و 15 درصد پروتئین خام در ماده خشک جیره بود. اجزای تشکیل ­دهنده جیره غذایی شامل یونجه، دانه جو، کنجاله سویا، دانه ذرت و سنگ آهک به ­ترتیب با 400، 488، 200، 589 و 20 گرم در کیلوگرم ماده خشک جیره بود. تیمارهای آزمایشی شامل سطوح مختلف لازالوسید (20، 25، 30 و 35 قسمت در میلیون ماده خشک جیره) بود. طول دوره آزماش 21 روز بود. مایع شکمبه 2 و 4 ساعت بعد از خوراک ­دهی صبحگاهی جمع ­آوری شد. در این تحقیق فاکتورهایی همانند pH شکمبه، زمان احیای متیلن بلو، زمان ترسیب شناوری، اسیدهای چرب فرار کل و نیتروژن آمونیاکی شکمبه اندازه­ گیری شد. pH شکمبه، زمان احیای متیلن ­بلو، زمان ترسیب شناوری و اسیدهای چرب فرار کل تحت تأثیر سطوح مختلف لازالوسید قرار نگرفت. نیتروژن آمونیاکی شکمبه با افزودن سطوح بالای لازالوسید کاهش معنی ­داری را نشان داد (0/05>p). نتایج نشان می ­دهد که استفاده از لازالوسید تا سطح 35 قسمت در میلیون ماده خشک جیره تأثیر منفی بر اکوسیستم و پارامترهای شکمبه ندارد و کاهش نیتروژن آمونیاکی شکمبه نشانگر کاهش فعالیت باکتری­ های تجزیه کننده پروتئین در شکمبه به ­واسطه افزودن لازالوسید می­ باشد. مقدم، غ.ع. و تقی ­زاده، ا.، 1379. بررسی اکوسیستم شکمبه و اولتراسونوگرافی حرکات پیش ­معده در گاوهای شیری تغذیه با زئولیت. مجله دانش کشاورزی. جلد 10، شماره 1، صفحات 18 الی 23. Abdoly, H.; Taghizadeh, A. and Tahmasbi, A., 2007. Effect of ionophore on rumen characteristics in sheep. Proceeding of AAAP Congress. 349 p.
Bergen, W.G. and Bates, D.B., 1984. Ionophores: Their effect on production efficiency and mode of action. J. Anim. Sci. Vol. 58, pp: 1465-1483. Bohnert, D.W.; Harmon, D.L. ; Dawson, K.A. ; Larson, B.T. ; Richards, C.J. and Streeter, M.N., 2000. Efficacy of laidlomycin propionate in low-protein diets fed to growing beef steers. : effects on steer performance and ruminal nitrogen metabolism. J. Anim. Sci. Vol. 78, pp: 173-180. Campbell, C.G. ; Titgemeyer, E.C. ; Cochran, R.C. ; Nagaraja, T.G. and Brandt, R.T., 1997. Free amino acid supplementation to steers: effects on ruminal fermentation and performance. J. Anim. Sci. Vol. 75, pp: 1167-1178. Chalupa, W.; Corbett, W. and Brethour, J.R., 1980. Effect monensin and amiclora on rumen fermentation. J. Anim. Sci. Vol. 51, pp: 170-179. Chen, G. and Russell, J.B., 1991. Effect of monensin and protonophore on protein degradation, peptide accumulation and deamination by mixed ruminal microorganisms in vitro. J. Anim. Sci. Vol. 62, pp: 2196-2203. Dinius, D.A. ; Simpson, M.E. and Marsh, B.P., 1976. Effect of monensin fed with forage on digestion and ruminal ecosystem of steers. J. Anim. Sci. Vol. 42, pp: 229-234. Erasmus, L.J. ; Smith, I.; Muller, A. and O'Hagant, D., 1999. Effect of lasalocid on performance of lactating cows. J. Dairy Sci. Vol. 82, pp: 1817-1823. Erickson, P.S. ; Davis, M.L. ; Murdock, C.S. ; Pastir, K.E. ; Murphy, M.R. ; Schwab, C.G. and Marden, J.I., 2004. Ionophore taste preferences of dairy heifers. J. Anim. Sci. Vol. 82, pp: 3314-3320. Fellner, V.; Sauer, F.D. and Kramer, J.K.G., 1997. Effect of Nigericin, Monensin and teronasin on biohydrogenation in continuous flow-through ruminal fermenters. J. Dairy Sci. Vol. 80, pp: 921-928. Hesni, V.; Taghizadeh, A.; Paya, H.; Janmohamadi, H.; Moghadam, G.H. and Pirani, N., 2007. Effect of monensin and lasalocid on rumen fermentation in sheep. Proceeding of the British Society of Animal Science. 221 p.
Holdsworth, P., 2003. The role of enteric antibiotics in livestock production. Published in 2003 Australia. Ives, S.E. ; Tigemeyer, E.C. ; Nagaraja, T.G. ; Barrio, A.;Bindel,D.J.andHollis,L.C.,2002.Effects of virginiamycin and monensin plus tylosin on ruminal protein metabolism in steers fed corn based finishing diets with or without wet corn gluten feed. J. Anim. Sci. Vol. 80, pp: 3005-3015. Lean, I.J. ; Wade, L. and Bechet, S.D., 1997. Bovine somatotropin and monensin: emerging technologies. Dept. Of Anim. Sci. University of Sydney Australia. Martin, S.A. and Macy. J.M., 1985. Effects of monensin, pyromellitic diimide & 2-bromoehtan sulfonic acid on rumen fermentation in vitro. J. Anim. Sci. Vol. 60, pp: 544-550. Morris, F.E. ; Branine, M.E. ; Galyean, M.L. ; Hubbert, M.E. ; Freeman, A.S. and Lofgrean, G.P., 1990. effect of rotating monensin plus tylosin and lasalocid on Performance, ruminal fermentation, and site and extent of digestion in feedlot Cattle. J. Anim.Sci. Vol. 68, pp: 3069-3078. Nagaraja, T.G., 1995. Ionophore and antibiotics in ruminants. Biotechnology in animal feeding. pp: 173-204. VCH Publishers, New York. Perry, T.W. ; Beeson, W.M. and Mohler, M.T., 1976. Effect of monensin on beef cattle performance. J. Anim. Sci. Vol. 42, pp: 761-765. Russell, J.B. and Hespell, R.B., 1981. Microbial rumen fermentation. J. Dairy Sci. Vol. 64, pp: 1153-1169. Swanson, K.C. ; Reynolds, L.P. and Caton, J.S., 2000. Influence of dietary intake and lasalocid on serum hormones and metabolites and visceral organ growth and morphology in wether lambs. J. Small Rumin Rese. Vol. 35, pp: 235-247. Thivend, P. and Jouany. J.P., 1983. Effect of lasalocid sodium on rumen fermentation and production by steers. J. Anim. Sci. Vol. 52, pp: 628-634. Wessels, R.H.; Titgemeyer, E.C. ; Armendariz, C.K. and Jean, G.ST., 1996. Lasalocid effects on ruminal degradation of protein and postruminal supply of amino acids on Holstein steers. J. Dairy Sci. Vol. 79, pp: 1802-1808. Yang, C.M.J. and Russell, J.B., 1993. The effect of monensin supplementation on ruminal ammonia accumulation in vivo and the numbers of amino acid-fermenting bacteria. J. Anim. Sci. Vol. 71, pp: 3470-3476. Yang, C.M.J. ; Chang, C.T. ; Huang, S.C. and Chang, T., 2003. effect of lasalocid on growth, blood gasses and nutrient utilization in dairy goats fed high forage, low protein diet. J. Dairy Sci. Vol. 86, pp: 3967-3971.